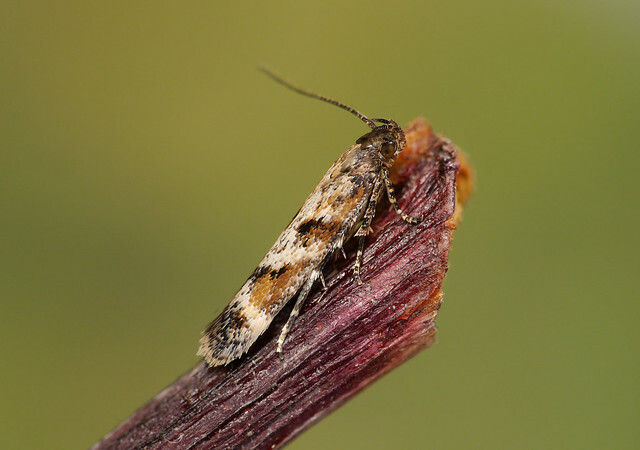 Hereford and Worcester Moths: Caryocolum junctella still present in the Wyre Forest. Caryocolum junctella still present in the Wyre Forest. 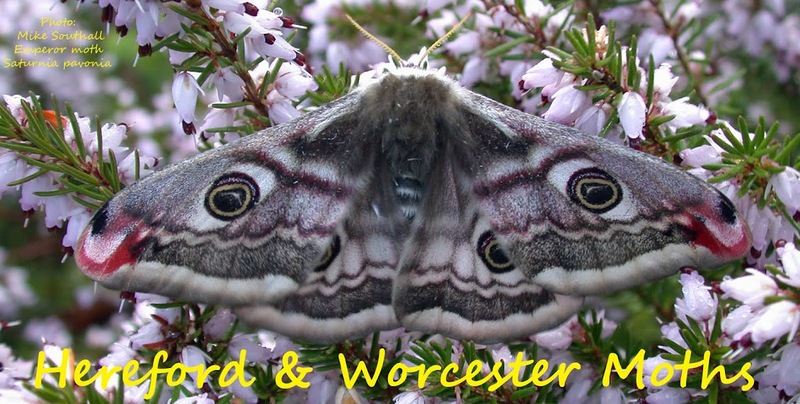 Back in early spring 1994 Tony Simpson and Mike Harper found a small moth flying in afternoon sunshine at a meadow near Lodge Hill in the Wyre Forest. This was eventually confirmed as Caryocolum junctella. At that time the life history of this species was unknown so they returned later in May and found larvae feeding on Lesser Stitchwort - Stellaria graminea which was growing on the tops of the many ant hills in the meadow. The species is unusual in it's family, overwintering as an adult and flying again 'post hibernation' in the spring. Since then the moth was encountered once more, at light in August, on the western edge of the Forest near Park House. Recent attempts to find the moth in the spring, either at light or flying during the day, have been unsuccessful so this year a concerted effort was made to find areas in the forest where the food plant still grows. Tony could find no lesser Stitchwort in the original meadow behind Lodge Hill. The tops of the ant hills were severely grazed and left largely bare. On June 1st I joined Tony and other members of the Wyre Forest Study group on a visit to the Park House site. This was a little more encouraging in that the food plant was present albeit in very low density. We also made a visit to a private meadow just outside the forest which had an abundance of Lesser Stitchwort but we could find nothing feeding at either site. Finally Tony and I tried the meadow in front of Lodge Hill Farm. 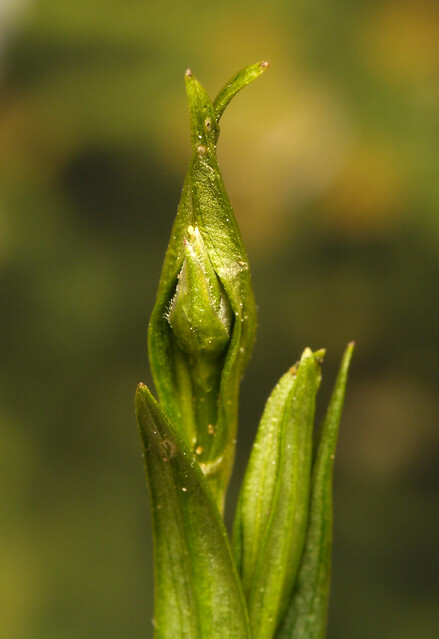 The plant was found in small clumps on the tops of ant hills and a couple of likely looking spun stems were found. Examining the spinnings under magnification confirmed that they were inhabited by small larvae. I also found several even smaller larvae on other stems collected more or less at random, there being little or no outward sign of occupation. 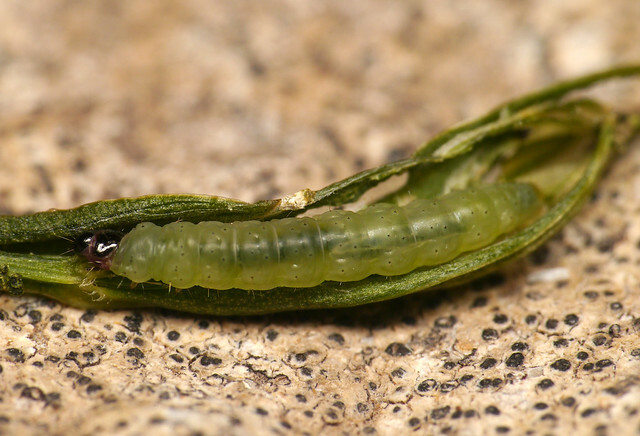 Leaving this material in boxes on clean paper for a few days, the larvae revealed themselves by the small piles of frass left below inhabited flowers and leaves. Tony and Mike described the larvae they found in 1994 as 'apple green' in colour. Initially the larvae found this year were pale cream, but they quickly darkened into a convincing apple green as they matured over the next two or three weeks. Once full fed they pupated in tissue. In all I collected 6 larvae. Their age range was quite wide, with the first two (those found in the spun plants visible in the field) pupating within two weeks. 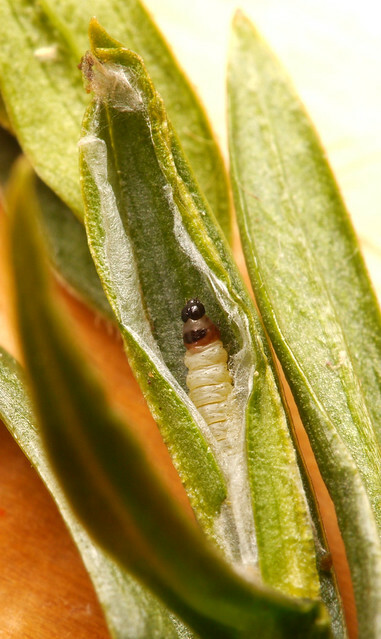 The smallest larvae took a further week to feed up before pupating. The first imagines emerged on 29th June. Nationally, Caryocolum junctella is classed as pRDB 3. Recent records are from the Highlands of Scotland and North Wales. It is therefore very good to know that the Worcestershire colony is still present. Admirable persistence and field work there Oliver! Couldn't agree more. Good work.